City directories are the forerunners of today’s telephone books. They were often published annually—and alphabetically listed heads of households and employed household members with their occupation and address. Directories are especially valuable for research in large cities where a high percentage of the people were renters, new arrivals, or temporary residents. In fact, a directory may be the only source that lists an ancestor if he or she was not registered to vote and did not own property. Most households were included because the directories were created for salesmen, merchants, and others interested in contacting residents of an area. The Family History Library has a great collection of City Directories for the United States. This includes 336 cities and regions from the late 1700’s to 1935. The pre-1860 city directories are on more than 6,000 microfiche. 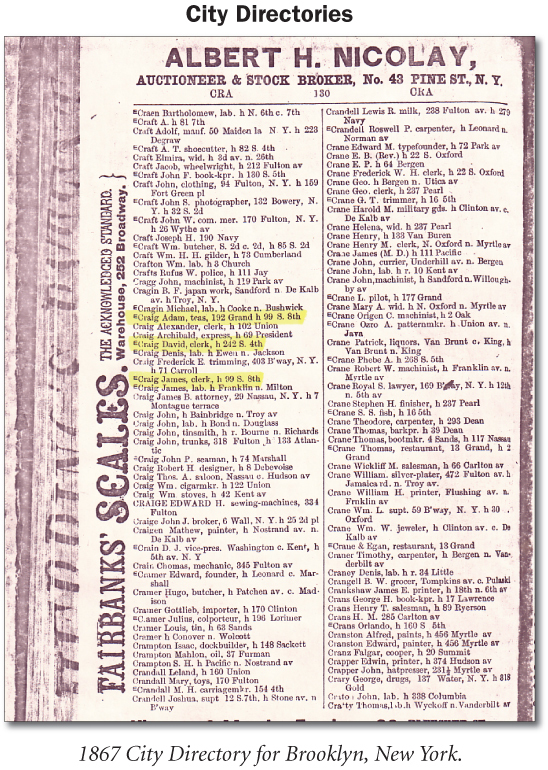 Directories for 1861 to 1935 are on 1,118 microfilms. TIP: City directories often contain what is called a “reverse” street directory, which lists streets alphabetically with the names of people residing at each address. These can be used to identify other members of the family at the same address who had different surnames. TIP: Not everyone was included in these old directories. Ancestors might not have been at home when the data was compiled or refused to answer the canvasser’s questions. In some cases, entire ethnic neighborhoods are excluded. TIP: The front section of a city directory is filled with valuable information which many newcomers simply skip past. They often list names which were received too late for normal insertion in the directory and all persons who refused to supply any information. There is generally a list of abbreviations which are used in the directory. 1) Family History Library — check the FHL Catalog under [State], [County], [Town] – Directories. 2) Local Library — contact the local library where your ancestor lived. They’ll usually have an excellent collection of their local directories and will make copies for you if you specify the surname and the years you’re interested in. 3) Allen County Public Library (Fort Wayne, Indiana) — they have an extensive holding of city directories.